History lovers, hold on to your hats and pack up your wagons (station wagons) and head out route 30 east to the laurel highlands this weekend – it is a double header of cultural festivals. We are often asked about what are the must-do events around Pittsburgh. Both of these festivals are on our list of favorites. And they happen to be on the same weekend so you can catch a double header of history celebration just outside of Pittsburgh this weekend. First stop – break out your bag pipes and kilt for the Ligonier Highland Games – a day long celebration of Scottish hertiage. 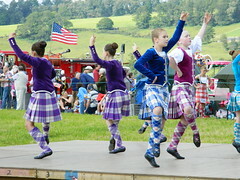 There will be athletic events such as tossing the caber (throwing a big tree trunk) and the Scottish hammer throw. Then steer your wagon (or mini van) down 711 south to Stahlstown – time to celebrate the important fiber of flax. Flax is what linen fabric is made out of. 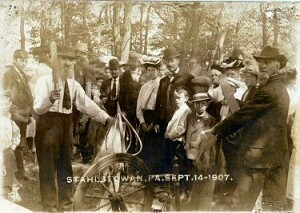 The Stahlstown Flax Scutching Festival is the 2nd oldest Scutching festival in the United States. They have been celebrating the scutching every year since 1907. Yep, 1907 – so join them for the 105th annual Flax Scutching festival to learn about how the flax plant is turned into linen cloth and snack on some buckweat pancakes too. Here is a map that includes both festivals and 2 other places that you should consider stopping – Joe’s Bar in Ligonier has the largest collection of taxidermy in North America and the Pie Shoppe in Laughlintown has good sandwiches and pumpkin cookies. The Google location for the Pie Shoppe is not correct – the Pie Shoppe is right on Route 30 – directly across from the Ligonier Country Inn.